The superb ACUTER PRO-SERIES Waterproof Spotting Scopes are perfect for serious terrestrial observations. Optical performance is excellent, with all models delivering crisp, bright, sharp, high-resolution images, across the entire field of view. An 8-24mm Zoom eyepiece is included with each model as standard. The standard multi-coated zoom eyepiece and fixed magnification accessory eyepieces all offer generous eye-relief, and fold-back rubber eyecups, making them suitable for spectacle wearers. The objective lenses are multi-coated for maximum light transmission and image contrast. Six models are available with a choice of 65mm, 80mm or 100mm objective lens diameters and Straight or 45° viewing angles. Focusing is ultra-smooth and the telescope tubes are covered with a protective rubberized paint finish to help protect from the elements. A T2 camera adaptor (Prod.Code 947) is available for the attachment of either SLR or DSLR cameras, and can now be used in conjunction with the zoom eyepiece supplied. All models can be mounted on a standard photographic tripod via an integral tripod bush. 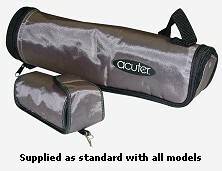 All models supplied with quality padded carrying case. Colour/Material: Black/Grey Rubber, Rubberised Coating.